20/80 St. Aidan’s Trail Half Marathon and 1/4 of the Challenge Completed! I travelled down to Eastbourne for work last week and ran along the beautiful coastline into the centre of town and back out again, which formed a convenient half marathon distance route. I felt strong throughout and finished in my second fastest time of one hour 46 minutes. Apart from being a really scenic route, the coastal flat path certainly helped me keep the splits down! On my third day in Eastbourne, I decided to try and pace myself to a two-hour half marathon. Pacing is something I have struggled with that I am keen to develop through the challenge. A two-hour half marathon works out at five minutes 40 seconds per kilometre (just under nine minutes, nine seconds per mile). I finished in a time of one hour, 59 minutes, maintaining a steady pace throughout. On my return to Leeds last Friday, I ran around familiar sites before sunrise. My legs felt strong and I think they are adapting to the distance and the regularity of the runs. I always find my speed much slower – up to 35 seconds per kilometre – when I wake up and run, as opposed to running later in the day after I have properly fuelled and hydrated. On Sunday, I ran at St. Aidan’s Trail Half Marathon, organised by Even Splits. The course and organisation were both fantastic, and I’m ashamed to say I had never heard of St. Aidan’s Nature Reserve before the event – despite having lived in Leeds for a total of five years! I will definitely attend more Even Splits events in future. I set off at PB pace, but my legs quickly reminded me this was my fifth half marathon distance in nine days. They say a smile costs nothing, but you wouldn’t think so by my face in the race-day photos! Really happy to have completed my first trail half marathon and excited to take on a few courses that are hillier in the coming months (particularly the one described as “Grimmer than Grim”). I ran the 17 hills of Kirkstall Road this morning built into my run. The hills are a monthly visit of Hyde Park Harriers and it was certainly a different experience running them alone at six in the morning! The frequency of runs in the past two weeks (this is my tenth since the start of October) have taken their toll slightly, and my legs feel heavy this evening. I will make a call tomorrow as to whether I rest until Rugby Half Marathon on Sunday, or whether I fit in another run on Thursday or Friday. And so brings about the quarter-way point of the challenge! It has been a great experience so far and I’m excited to meet lots more people in the coming months and share our stories. If you would like to run (or walk!) with me, please get in touch. Thank you also to everybody who has donated, I’m delighted to be at 18% of my funding goal, but there’s a long way to go! If you haven’t donated yet but would like to do so, please click here. I put a post on running tracking app Strava – which I use to track all of my runs – to see if anybody would like to join me for a run last Saturday. After each of the official events so far, I have followed all of the people who have matched the route on Strava to try and spread awareness of the challenge. Dr Chris, who also ran Kenilworth Half Marathon at the start of September, said he would drive from Leamington to join me for an afternoon run. For anybody who has Strava, please follow my runs for pace, distance, heart rate, elevation, and other stats! There’s a link on the navigation bar of the website or search “80in8”. It was good to talk to Chris about our training – it was actually Chris’ first time running with a partner. For me, running alongside somebody helps me to keep pace and push myself. We kept a strong pace throughout and Dr Chris managed to reach his PB – hopefully he will go on to get a similar (or better!) time at Rugby Half Marathon at the end of the month! We finished the run in a time of one hour 49 minutes. I talked to Chris about how after some of my longer evening runs I wake up during the night with hot sweats. He put this down to hypoglycaemia and said I should take on a sugary drink and some slower release carbs – I find Lucozade energy usually does the trick! I’m hoping to run with Chris again in the coming months and will look forward to catching up with him at Rugby Half Marathon later this month. I set off on Monday morning before sunrise – my first head-torched run of the challenge! My legs felt quite tired from my run with Chris, and the “all you can eat” Chinese meal the evening before didn’t do me any favours. I completed the distance in a slower, steady pace, no doubt carrying a few extra pounds than usual! After speaking with Duncan of North Ridge Adventure last weekend, I decided to build an interval session into my midweek run this week. I set off at a steady pace and then after around five miles (~8.5km) I did intervals of 100, 200, 400, 800, 800, 400, 200, 100-metres at a fast pace, each interval followed by a 200-metre slow paced recovery. I really enjoyed the interval session and will try to build one a week into my sessions, as well as more hill running, as I try to improve my pace throughout the challenge. I set off first thing Saturday morning to Meanwood Valley Trail in Leeds, which transports you immediately from the city into what feels like a countryside escape! I took a wrong turn on the trail and ended up having to slide down a fairly steep bank, over some tree trunks and boggy mud to find my way back. My pace was kept quite slow throughout, but I worked out that I had completed around 55 miles in the past seven days – the most I have ever done! I am heading down south for work this week, so will look forward to some runs along the coast! Thank you to everybody who has supported me so far. Donation link here. 11/80 Great Scottish Run – New PB, New Pals! I drove up to Edinburgh on Friday ahead of a day in Aberfeldy with my family friend Ruth. She made me an amazing breakfast of ‘smokies’ – looking back I’m sure this was what provided the fuel for my PB at Glasgow the next day! I woke early on Sunday for my usual pre-race meal of overnight oats, before setting off to meet Daniel and David – who are both also running 2019 London Marathon for Dementia Revolution – to travel together to Glasgow by train. Dale, a friend of Daniel and David, also met us on the train and he was running his first half marathon for MIND. We got on like a house on fire and all said at the end of the day it was as if we had known each other for years! We arrived in Glasgow early to meet Derek, who very conveniently has an office by the start line of the race, to make introductions and talk through charity work. Derek also runs for dementia charities, but was running on Sunday for JAPES – a charity that works to provide people with mobility challenges the opportunity to participate in mass running events. Derek and his team pushed a charriot throughout the half marathon distance. An absolutely brilliant achievement for all involved! I managed to get an interview on BBC which was broadcast across the UK ahead of the start, which can be seen here. We set off at 11.30am after a group warm up. I’m not sure if group warm ups at events are overly effective, but they’re definitely a way of building atmosphere ahead of the start! On the route we saw bagpipers, bands, magicians, and the support was fantastic throughout. Lots of children were out with their “push to go faster” signs, and the overall experience was brilliant. We set off at a pace faster than I usually would start at, but I was delighted when we managed to keep pace throughout and I finished in a new PB of 1:43:31. I am excited to travel back to Scotland for Hogmanay this year and will meet up with David, Derek, Daniel and Dale again, as well as some of the members of the Running Friends Scotland Facebook group. And there completed month one of the challenge — on to October! I set off on another run on Tuesday and completed a solo 21.1km route around Leeds, before meeting up with Hyde Park Harriers for a #RunandTalk mental health run, to promote the positive impact of running on mental health, and the importance of talking openly when we are going through a tough time. You shoud look our for #RunandTalk events local to you! On Tuesday, I ran approximately 28km, so I will call it the first day of “longer distance” training ahead of London! I am delighted to be at 12% of my funding goal at this stage of the challenge and thank you so much to everybody who has already donated through the following link. Thankfully the flight took off later that day and despite from the drunk woman stroking my hair – eight hours in Leeds Bradford Airport had clearly taken their toll – it was a fairly uneventful 40-minute journey over the Irish Sea. Camping plans unfortunately had to be laid to rest, so I spent the night in Dublin and I travelled with my friend to the West Coast early Saturday morning in time for the start of Clew Bay Half Marathon. The undulating route left Louisburgh and went along the Atlantic coastline. It was a really stunning road race and by far the most scenic of my runs so far. Following the Wild Atlantic Way, we made our way back to Dublin via an overnight stay in Westport and a daytrip to the beautiful Achill Island. There is an ultra-marathon in May which follows the Wild Atlantic Way, for which a flyer was handed out at the finish. Safe to say I’m more than a little tempted as that will be a month after 2019 London Marathon! Would anybody like to join? 9/80 I set off from the centre of Dublin to run out to Dún Laoghaire, the port where many Irish relatives waved to their loved ones as they set off to war, many never to return. It’s a really significant place that evokes a lot of memories of songs from my childhood, so I was happy to be able to include it as part of the challenge. I took a wrong turn and almost missed the start of the run with Dublin Runners and Dún Laoghaire Pier Runners. My friend picked me up on her way to the run, so thankfully I managed to make it in time for the start! The running club were an extremely welcoming and lovely group of people, who ran alongside me and pushed me to finish my ninth run of the challenge. I really hope to be able to make it back to run with them on my next trip to Ireland. I plan to arrange a trip up north to Armagh at the end of this year or beginning of next, to run around places familiar to my Grandma from her childhood. I will also be on the lookout for official events in the new year that I can enter. My next run is Great Scottish Run on Sunday in Glasgow. I’ll be meeting up with two other runners who are raising money for dementia research, so it will be great to support each other along the route. Thank you to everybody who has donated so far. For anybody who would still like to donate please see click here. 5/80 On Sunday 16th I took part in Rutland Half Marathon, situated at beautiful Rutland Water in the East Midlands. This was run five of 80 of the challenge. It was a great course and a really well organised event. Running alongside sheep and cows, around the gorgeous lake and with some very supportive members of the running community. I took this event a little easier as I completed four half marathons in the first eight days of the challenge, and am still coming off a knee injury. I also have a lot of travel and events to come this month. On route were GU carbohydrate gels, coconut water stops, and at the finish a lovely technical t-shirt and medal (as well as lots of support on route). I was really happy that more people spotted my challenge t-shirt and reached out after the event on Strava. I hope to meet some of them for a run when I’m back in the midlands in the coming months! I’d highly recommend the event to anybody thinking of taking part next year. 6/80 Yesterday (Tuesday 18th) I completed the sixth run of the challenge, setting off from my mum’s house in Earlsdon, Coventry, out to Kenilworth, past Warwick University, and back. It’s one of my favourite “familiar” routes to run and I managed to register a decent time. Don’t forget to follow my Strava! (Link on the navigation bar of the website). I struggled slightly with my pacing following a short stop at a pub to get a glass of water, but will certainly learn from it as I head into the next few weeks. This Friday I travel to Ireland to run at Clew Bay Half Marathon on Saturday in County Mayo. My family are from Ireland (my Grandad is from County Mayo), so it will be somewhat of a pilgrimage. A friend and I will be camping on Friday before the run on Saturday – let’s hope the Irish skies are kind to us… no chance! Thank you to everybody who has donated so far. You can donate here and all money goes to towards dementia research. Every penny counts and your donations are hugely appreciated! Don’t forget to follow my social media channels, which can be found on the ‘Get in Touch‘ page of the website. 4/80 Vale of York Half Marathon. Week One Complete! I had a fantastic time running Vale of York Half Marathon on Sunday. I ran with Anna who is completing her 12 half marathons in 12 months challenge — a great achievement having ran past 10km for the first time in April this year! It was brilliant that Anna managed to achieve her PB in just over 2hr40mins, and I hope to catch up with her later in both of our challenges! This marks four runs completed in the first eight days of the challenge. For the other two solo runs, my times and routes can be found on Strava. Next weekend marks a double-header with my first trail half marathon (Kent) and an event the next day (Gloucester). Lots of hours of driving upcoming, but very excited to explore and run in two new places. A couple more rest days for my legs and then will be back to making it 6/80 by the end of week two! Thank you all so much for the kind donations so far, and check back early next week for the next update on this week’s events. I completed the course in just over one hour 56 minutes, with my first half splits significantly faster than the second. I felt strong throughout, but I am just coming off a torn MCL, so I am happy that my knee felt comfortable. The course was beautiful; through the castle grounds and out into the country, with good support along the way. A great medal and technical t-shirt (and some other goodies) at the end – I donated the Mars Bar, though! Feeling really positive about the coming weeks as I get the first runs under my belt. During September I’ll be running in Kenilworth (today), York, Kent, Gloucester, Mayo (Ireland) and Glasgow (Scotland). Three countries in a month, with some really exciting plans for the coming months, too! I was also really happy to receive my first donation from somebody who had seen my challenge t-shirt on route – a man called David who ran behind me for a section and later visited the website. Thank you to David, if he reads this! I have followed as many runners from today who did the same route on Strava in the hope that it will encourage more people to get in touch about running alongside me during the challenge. If you would like to run (or walk!) with me for a section, or a full half marathon, please get in touch. Kenilworth Half Marathon Finish: 1 hour 56 minutes. Average Splits: 5:27/km — 8:47/mile. Weight: 78.5kg — 12.4 stone. 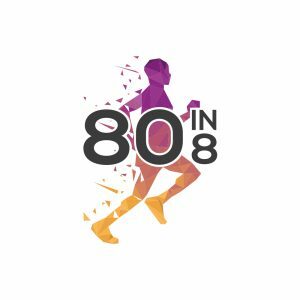 You can learn more about the 80in8 journey and my reason for starting it here.